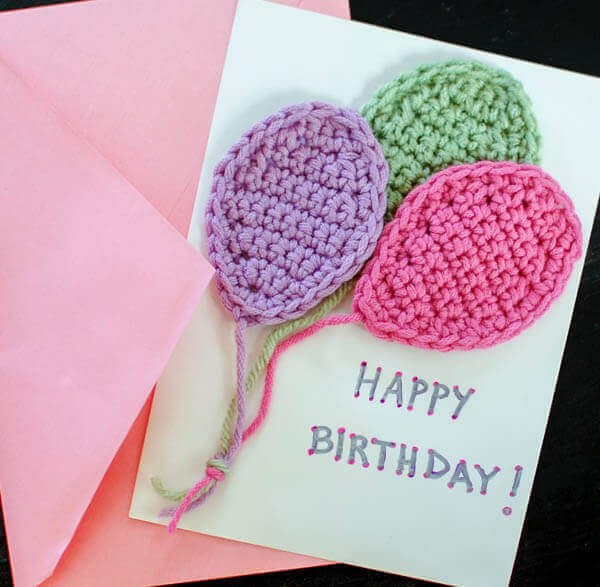 These adorable crochet balloons make a great applique for any celebration! Think birthday or other celebration cards, an applique to adorn a hat or headband for your little one’s special day, afghan squares … there’s no limit! I can’t wait to see what you guys create with it. Join the new Petals to Picots community group on Facebook and show off your projects. 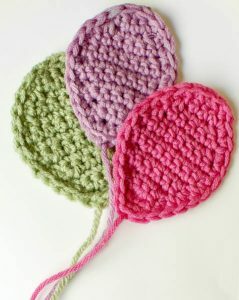 Click here to reference Crochet Abbreviations. 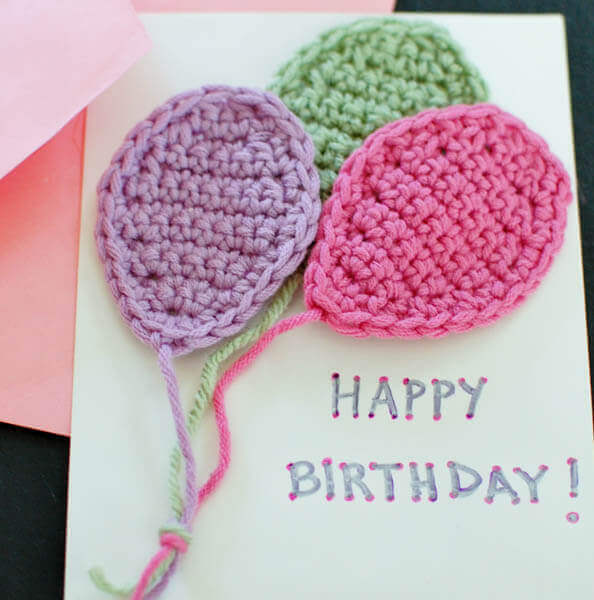 Begin as usual with a slip knot on your hook but leave a long tail to use as the strings for the balloons. Row 1: Work 1 sc in 2nd ch from hook, 1 sc in next ch, turn — 2 sts. Row 2: Ch 1 (does not count as st here and throughout), work 2 sc in each st, turn — 4 sts. Row 3: Ch 1, work 1 sc in each st across, turn — 4 sts. Row 4: Ch 1, work 2 sc in first st, 1 sc in each of the next 2 sts, 2 sc in last st, turn — 6 sts. Row 5: Ch 1, work 1 sc in each st across, turn — 6 sts. Row 6: Ch 1, work 2 sc in first st, 1 sc in each of the next 4 sts, 2 sc in last st, turn — 8 sts. Row 7: Ch 1, work 1 sc in each st across, turn — 8 sts. Row 8: Ch 1, work 1 sc in each st across, turn — 8 sts. Row 9: Ch 1, work sc2tog, 1 sc in each of the next 4 sts, sc2tog, turn — 6 sts. Row 10: Ch 1, work 1 sc in each st across, turn — 6 sts. Row 11: Ch 1, work sc2tog, 1 sc in each of the next 2 sts, sc2tog, turn — 4 sts. Row 12: Ch 1, work 1 sc in each st across, turn — 4 sts. Row 13: Ch 1, work sc2tog twice, turn — 2 sts. Edging: Ch 1, work 1 sc in next 2 sts and continue working a sc edging evenly around balloon, join in first st of round. Fasten off, weave in ends. Pull long beginning tail through bottom sc. Repeat with as many balloons as desired. Knot the tails together to form a bundle. Amazing! How do you suggest attaching them to a card? glue? Sewing? So glad you like it! I just used a hot glue gun. I would attach it to a lapel pin and pin to card. This way it can be worn on collar or such. Thank you 🙂 This is so cute!! Is this on Revelry yet?